Climate change is likely to increase the risks related to heat waves in urban areas. We map spatial pattern of heat wave vulnerability and risk in the Helsinki metropolitan area in southern Finland. First, we assess differences that zoning, i.e., differences in spatial units of analysis, and weighting, i.e., weights given to indicators when constructing the index, cause in map production. Second, we evaluate how maps of consensus and certainty could pave the way for visualizing and assessing uncertainties in risk and vulnerability indices. For vulnerability, we use socioeconomic data using 5 different zoning options and 11 different weighting options. For risk, we add two extra layers to vulnerability maps: hazard map showing the spatial pattern of heat based on Landsat satellite images and exposure map showing the spatial pattern of population. We found that when different zoning options are used, the spatial pattern of vulnerability may differ dramatically. In risk maps, the differences between zoning options are smaller. Contrary to previous literature, differences in indicator weighting alter the final maps slightly. The consensus and certainty maps show their potential, e.g., in pointing out areas which may have both high risk/vulnerability and high certainty for risk/vulnerability. Finally, we discuss other possibilities in tackling the uncertainties in mapping and propose new avenues for research. The online version of this article ( https://doi.org/10.1007/s10113-019-01491-x) contains supplementary material, which is available to authorized users. Climate change is likely to increase the risks related to heat waves (IPCC 2014; Zhou et al. 2017). The urban heat island (UHI) effect, denoting that temperatures in urban areas are higher than in surrounding areas (Oke 1982), magnifies the negative impacts of heat (Klein Rosenthal et al. 2014). Vulnerability to heat has been of interest to many when considering how climate change will impact cities (Abrahamson et al. 2009; Conti et al. 2005; El-Zein and Tonmoy 2015), given that it is likely to be the climate impact that will cause most fatalities (Luber and McGeehin 2008). During the past decade, there has been a rise in UHI mappings (de Groot-Reichwein et al. 2018; Ho et al. 2015; Huang et al. 2011; Lissner et al. 2012; Tomlinson et al. 2011; Weber et al. 2015). These maps are typically vulnerability or risk maps based on indices (e.g., Cutter et al. 2003; Preston et al. 2011; Reckien 2018). Indices combine several different indicators, which in the case of UHI include elements linked, e.g., to spatial patterns of temperature, city structure, population density, and socioeconomic characteristics of the population within the city (de Groot-Reichwein et al. 2018; Ho et al. 2015; Huang et al. 2011; Lissner et al. 2012; Tomlinson et al. 2011; Weber et al. 2015). The index approaches have been subject to criticism on many grounds. Most notably, Hinkel (2011) argued that indices are ill-fit for steering mitigation and adaptation policies and raising awareness, although they are widely used in these purposes. This is because vulnerability cannot be readily measured and generalized using simple indices. There are multiple steps in the map-making process which have effects on the final maps, and acknowledgement and analysis of the uncertainties could help to develop more robust mapping approaches (Tate 2012). The amount of uncertainty and its sources can be analyzed with sensitivity and uncertainty analyses (Borgonovo and Plischke 2016; Ferretti et al. 2016; Saisana et al. 2005). Uncertainty analysis means evaluation of how uncertainty in input factors affects index values, and sensitivity analysis denotes how much each uncertainty source contributes to the output variance (Saisana et al. 2005). There are multiple different methods for conducting sensitivity analyses (Borgonovo and Plischke 2016). Within vulnerability and risk index studies, both simple methods, such as manual indicator removal (Mainali and Pricope 2017), and more complicated techniques, such as Monte Carlo simulation and variance-based global sensitivity analysis (Feizizadeh and Kienberger 2017), have been used. Furthermore, while some have assessed only one or a few uncertainty sources (Feizizadeh and Kienberger 2017; Mainali and Pricope 2017; Schmidtlein et al. 2008), others have analyzed the relative contribution of multiple sources (Tate 2012). Usually, in index-based vulnerability and risk maps, data is spatially aggregated to administrative boundaries, as point-level socioeconomic data is not commonly available (Jeffery et al. 2014). The aggregation of spatial data leads to problems in data analysis. The most notable of these problems is the modifiable areal unit problem (MAUP, Ho et al. 2015; Mas et al. 2015; Perveen and James 2012). The inherent problem with the MAUP is that areas can be delineated in a multitude of ways, and results calculated from the differing areas vary (Fotheringham and Wong 1991; Openshaw and Baxter 1977; Páez and Scott 2005). MAUP becomes evident when the original higher-resolution dataset is either scaled (scaled to coarser scale/resolution with evenly sized areas) or rezoned (scaled to the coarser scale/resolution with differently sized areas) (Ho et al. 2015; Mas et al. 2015). We use the term zoning to point out problems related to both scaling and rezoning effects. So far, few studies have examined the uncertainties that arise from the spatially aggregated data used for socioeconomic vulnerability or risk index preparation. As an exception, Ho et al. (2015) showed mismatches in combining exposure and vulnerability maps can cause problems related to MAUP. On the other hand, Rothlisberger et al. (2017) compared different data aggregation techniques, when mapping flood exposure but they did not map vulnerability, and Kienberger et al. (2009) and Lang et al. (2014) tried to form optimal areal units that do not follow administrative boundaries. In addition to the spatial uncertainties, the vulnerability and risk maps may differ based on other choices in map production. Multiple studies have compared different indicator weighting options (Feizizadeh and Kienberger 2017; Reckien 2018; Schmidtlein et al. 2008; Tate 2012; Wiréhn et al. 2015). It has been suggested in various studies that local indicator weighting together with stakeholders helps in fitting the more general indices to the local context (Kazmierczak 2015; Preston et al. 2011; Reckien 2018; Rød et al. 2015). Further options include data transformation and normalization techniques (Tate 2012). For instance, Reckien (2018) compared area-based (i.e., number of people in an area) and population-based (i.e., proportion of population in an area) normalization of data. Also, the chosen indicator set and indicator selection method has an impact on the final maps (Feizizadeh and Kienberger 2017; Mainali and Pricope 2017; Tate 2012). Reckien (2018) compared additive indicator selection with reductionist selection. In the former, input data consists of those variables that either very likely affect vulnerability or have shown to affect vulnerability (Lee 2014; Reckien 2018). In the latter, a large number of potential variables are reduced to a smaller set by a statistical technique, such as principal component analysis (Lee 2014; Reckien 2018). Within principal component analysis, several component selection and weighting methods have also been evaluated (Schmidtlein et al. 2008; Tate 2012). Moreover, different visualization options have been compared. Wiréhn et al. (2015) showed how quintile-based visualization differs from equal intervals and discussed how different options can be used in different purposes. However, de Groot-Reichwein et al. (2018) did a more comprehensive survey on different visualization options and suggested that single-map presentations are preferred by stakeholders. Finally, there are uncertainties caused by future changes; in other words, spatial pattern and of degree of vulnerability and risk are dynamic. However, although climate change vulnerability and risk assessments should look toward future (Hinkel 2011), assessments are usually static (Jurgilevich et al. 2017). Therefore, assessments could include projections about future changes using multiple different methods (Jurgilevich et al. 2017). Overall, the uncertainties caused by other methodological choices are seldom accounted for in vulnerability and risk-mapping approaches (Reckien 2018), and few have developed methods for illustrating map uncertainties using single maps which could be utilized by stakeholders. We concentrate on two factors causing uncertainty, zoning, and weighting, i.e., differences in spatial units of analysis and weights given to indicators when constructing the index. We do not intend to carry out a full sensitivity analysis of all factors causing uncertainties, but we concentrate on two major factors and demonstrate how sensitivity analysis could be incorporated into map production by simple techniques. In the context of UHI vulnerability and risk in the Helsinki metropolitan area in southern Finland, we (1) assess the differences in vulnerability and risk maps caused by different zoning and weighting alternatives and (2) demonstrate how color-based visualization (hue and saturation) and composite maps (average and standard deviation) could pave the way for visualizing and assessing uncertainties in risk and vulnerability indices. Our study area consists of Helsinki, Espoo, and Vantaa municipalities in Helsinki metropolitan area (60°07′–60°24´N, 24°30′–25°15′E). The overall population of these municipalities is 1.14 million, which is about 20% of the Finnish population. The study area includes densely and sparsely built residential areas, industrial and commercial areas, agricultural areas, and forests. The population density of the study area is 1490 per km2. Although the study area is located in temperate zone with reasonably cool climate, UHI and heat waves during summer months are one of the key climatic and weather hazards in the area (Ruuhela et al. 2017), and they have been emphasized in climate change adaptation plans (Helsinki Region Environmental Services Authority 2016a). We acquired vulnerability and exposure data from Statistics Finland (2018), from the Cities of Helsinki, Vantaa and Espoo (Aluesarjat 2018), and Helsinki Region Environmental Services Authority (2016b, 2017). All the vulnerability and exposure datasets were from year 2015 or 2016. For mapping the hazard, we used two USGS Landsat 8 satellite images from years 2014 and 2015. Using the nomenclature from the latest IPCC reports (IPCC 2014), we separate vulnerability from risk. Climate risk is composed of hazard (climatic phenomenon and its spatial configuration; in our case, heat wave), exposure (the elements that are under risk in specific locations; i.e., population), and vulnerability (characteristics of the exposed elements, i.e., socioeconomic characteristics of the population). In assessing vulnerability, only socioeconomic data is included and vulnerability maps show the pre-existing conditions (c.f. Joakim et al. 2015) in specific neighborhoods, while risk maps highlight the locations for combination of high vulnerability, exposure, and hazard. It has been discussed that area-based estimates of vulnerability (person/km2) provide the most plausible and robust maps and emphasize areas with a large number of vulnerable inhabitants, but population-based estimates (% of vulnerable population) indicate areas with high relative social vulnerability (Reckien 2018). We chose to combine population-based vulnerability data with area-based exposure data. We decided to use an additive method for indicator selection, as it has been shown that it is easier to interpret and is usually preferred by stakeholders (Reckien 2018). We chose eight different determinants that were drawn with the help of a literature review: childhood, elderly, gender, ill-health, low income, low level of education, immigration, and poor social networks (Table 1), which can be divided into endogenous and exogenous factors (c.f. Hinkel 2011). Said determinants correspond to the set of most significant indicators affecting individual’s vulnerability, as identified by Lee (2014) based on their comprehensive literature review on the topic, and have been frequently used in the field (Preston et al. 2011). Of these determinants, all but gender and immigration have also been previously identified as particularly relevant factors influencing individuals’ vulnerability in Helsinki metropolitan area (Kazmierczak 2015). Inclusion of immigration as a determinant of vulnerability in the present study was justified by both its role being highlighted in the literature for the Nordics (Rød et al. 2012) and in the USA (Cutter et al. 2003). A connection between gender and vulnerability has also been established in the literature (Preston et al. 2011). Due to lack of suitable data, we could not construct a suitable indicator for the ill-health determinant. For the other determinants, we used indicators shown in Table 1. Childhood, often considered to be between 0 and 18 years (Mokkink et al. 2008), is one of the most important vulnerability factors related to weather-related stresses (Carnes et al. 2014; Hajat et al. 2010). Elderly (≥ 65 years) suffer from health conditions which may worsen due to heat waves (Carnes et al. 2014; Hajat et al. 2010). It has been estimated that in most cities in Italy during 2003 heat wave, 94% of the deaths that occurred were those over 74 year olds (Conti et al. 2005). Also, other studies have reported that elderly are particularly vulnerable to heat waves (e.g., Fouillet et al. 2006). Gender does not appear to play a large role in terms of heat stress with no conclusive evidence yet (Basu 2009; Ye et al. 2012). There are some biological differences, leading to women being more vulnerable (Kaciuba-Uscilko and Grucza 2001), and in heat waves, a higher excess mortality for women has been reported (Fouillet et al. 2006). Relative poverty can result in social exclusion from society, in terms of practices, customs and activities (Townsend 1979), and increase an individual’s vulnerability (Gallie et al. 2003). Low economic status can also weaken the availability of information and the use of technology (Cutter et al. 2003). Moreover, those who are poorer often take short-term coping measures, such as sale of assets, which may increase longer term vulnerability (Tanner and Mitchell 2008). Some adaptation measures, such as insurance, are often not accessible to poorer people (Powell 2009). The proportion of households which belong to the two lowest income deciles (≤ 16,466€ yearly income). The lowest income category has been found to be a suitable indicator for weak economic status (Kazmierczak 2015). Household level low income was highly positively correlated with individual-level low income at postal code zoning level (Pearson’s r 0.77), and individual’s economic status is often more determined by the household income rather than personal income. Low level of education correlates closely with low socioeconomic status and health problems (Cutler and Lleras-Muney 2008; Galobardes et al. 2006). It has been shown that level of education largely determines one’s economic status, and is strongly linked to one’s working career (Galobardes et al. 2006). In the Finnish context, basic level studies can be regarded as low level of education (Kazmierczak 2015). Immigration status may also increase vulnerability, particularly in cases where language skills are low (Cutter et al. 2003; Lee 2014; Rød et al. 2012). Language barrier can be considered the most important factor increasing immigrants’ vulnerability (Cutter et al. 2003; Lee 2014). During extreme weather events, strong family ties (Browning et al. 2006) and collective action (Adger 2003) reduce vulnerability. The rate of heat-related deaths have been observed to be lower in neighborhoods that are considered to be more close-knit (Klinenberg 2002). People living alone have been reported to be highly vulnerable to heat waves (Fouillet et al. 2006). Unemployment has been found to correlate with social isolation (Kieselbach 2003). We weighted the indicators based on a Delphi evaluation (Helmer-Hirschberger 1967; Linstone and Turoff 1975). In the Delphi method, an expert group assigns subjective weights on different determinants (Brooks et al. 2005; El-Zein and Tonmoy 2015; Hinkel 2011; Kumpulainen 2006). 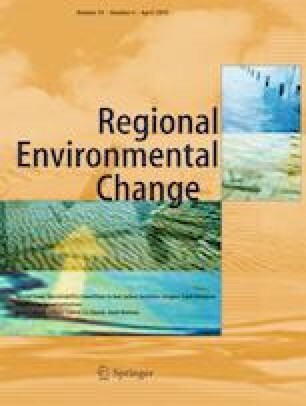 We selected a panel to represent the sectors that have to deal with climate change impacts in relation to individual vulnerability specifically. The participants included representatives from the following sectors: electricity distribution, water works, food, public transport, and health care. These reflect the categorization made by the Ministry of Agriculture and Forestry that have been identified as sectors to be directly impacted by climate change (Sorvali 2013) with a specific emphasis on Helsinki and individual vulnerability. The selection of experts was further motivated by the identified need to integrate social vulnerability studies with sectoral vulnerability studies in order to map vulnerability comprehensively (Holsten and Kropp 2012). Such an integrative approach is novel and thus particularly relevant in the context of heat waves in Helsinki Metropolitan area, where the typically cool climate and the relatively high operational reliability of critical services have perhaps led to the marginalization of this nevertheless crucial area of vulnerability research. As opposed to a traditional Delphi, the selected panel did not attempt to reach a consensus but was identifying the relative importance of each determinant based on their own sector. The Delphi consisted of two rounds at the end of 2015 and spring 2016. The first round was a semi-structured interview (DiCicco-Bloom and Crabtree 2006), including five sector-specific sessions, conducted individually or in pairs with nine interviewed experts. The interview guide followed the conceptualization of climate vulnerability and risk, aiming to establish the specific ways in which the chosen determinants contribute to heightened individual vulnerability in relation to the climate change-induced malfunctions of the interviewees’ respective sectors in Helsinki Metropolitan area. Specifically, interviewees were asked to reflect both upon the potential compromising effect heat waves and other extreme weather events might have on the service provided by their sector, and to predict how defects in said service might stress the adverse effects of heat waves on vulnerable individuals. The first round provided justifications and explanations to the second round of the Delphi, consisting of an electronic questionnaire, where the interviewees ranked the comparative importance of different determinants in relation to heat waves and individual vulnerability. The scale was from 1 to 8, with the highest value indicating the most important determinant. This type of ranking has been commonly used in vulnerability research (Brooks et al. 2005; El-Zein and Tonmoy 2015; Hinkel 2011; Kumpulainen 2006). The questionnaire was sent to nine respondents over e-mail with a 2-week response period, and the response rate was 100% (Table S1). We used five different zoning options when mapping vulnerability. First four options were different statistical areas used by the cities, called here small (297 zones, average area 2.6 km2), medium (120, 6.4 km2), large (22, 34.7 km2), and municipality (3, 254.8 km2). These four zonings were embedded into each other, so they shared the boundaries. In Vantaa, there was statistical data only for three areas (municipalities, large, small). We used the smallest administrative areas in Vantaa in both small and medium zoning option. The fifth option were the postal code areas (169 zones, 4.5 km2), which are used by the Statistics Finland. For all zonings, similar indicators were used. We calculated the spatial pattern of hazard using Landsat 8 data and land surface temperature (LST) in 30 m resolution. LST is measured through calculations of the brightness of the Earth’s surface and are not directly correlated to air temperature (Tomlinson et al. 2011). Ground-based empirical measurements of air temperature are not usually used when mapping UHI because of the low resolution of available data. This is due to the lack of an extensive grid of physical measurement stations in urban areas (Buscail et al. 2012). According to a comparison by Yu et al. (2014), a radiative transfer equation-based method using Landsat 8 band 10 was the most accurate LST-inversion method for Landsat 8; therefore, we selected it for the LST-conversion. In the method, band 10 values are first converted to top-of-atmosphere radiance and then to LST using an equation which takes into account surface emissivity, atmospheric transmittance, upwelling radiance, and downwelling radiance. We calculated land surface emissivity with the help of the image-specific normalized difference vegetation index values, and retrieved other parameter values from NASA’s atmospheric correction parameter calculator [https://atmcorr.gsfc.nasa.gov/, (Barsi et al. 2003; Barsi et al. 2005)]. Previously, it has been shown how the spatial pattern of early summer and mid-summer heat waves differ in coastal cities such as Helsinki (Hjort et al. 2016). The water mass in the sea slowly warms during the summer months, and there is a clear difference between June and July (Hjort et al. 2016). Hence, we chose two Landsat 8 images representing early summer (July 3, 2015, path 189/row 18) and mid-summer (July 25, 2014, path 188/row 18). The 2015 image was taken on the third hot day of the summer, whereas the 2014 image was taken after 3 weeks of high temperatures. According to weather observations by the Finnish Meteorological Institute, both dates were classified as hot days (temperature over 25 °C). We calculated average temperature in Celsius over the two LST-images. We generated 11 different weighting options for the vulnerability indices: no weighting, weighting based on weights given by nine individual respondents, and average weights over individual respondent values. In addition, we tested five different zoning options. Therefore, we compared 55 different (five zonings and 11 weightings) vulnerability and risk indices. We mapped exposure by calculating the amount of people in 250 m grid cells (Fig. S1a). We did not use cells with population of less than five people. In order to make different datasets comparable, we resampled vulnerability and hazard (Fig. S1b) maps to the 250 m grid cells, which corresponded to the exposure layer. The scaling of the vulnerability and hazard maps could potentially cause some uncertainties, because within each 250 m grid cells, multiple values for vulnerability or hazard can be found. We tested the degree of certainty by calculating the standard deviation of temperature (i.e., hazard) and unweighted vulnerability index values within each grid cell. The average standard deviation in temperature values over all grid cells was 1.1 °C for both temperature images. The average standard deviation for vulnerability indices ranged between 0.0 (index with municipality zoning) and 0.1 (index with small zoning; index values ranged between 2.08 and 5.31). Based on this analysis, we judged that uncertainties caused by resampling were small. We removed grid cells which did not have data for one or multiple layers from the analysis, and the final set consisted of 5480 grid cells. We normalized hazard, exposure, and vulnerability indicator values by dividing the values by the maximum grid cell value of each indicator (Reckien 2018; Yoon 2012). When calculating the vulnerability indices, we summed indicator values to form a final index. For risk indices, we normalized the summed vulnerability index values by dividing them by the maximum value and then summed vulnerability with normalized hazard and exposure values. When comparing the different indices, we calculated Pearson correlation coefficients (r) between the different maps. Correlation analysis quantifies the similarity between two maps, and it has previously been used to analyze differences between different vulnerability maps (Yoon 2012). Additionally, we constructed consensus and certainty maps. We built the consensus map by calculating the average vulnerability/risk over all 55 vulnerability/risk indices in each grid cells, whereas we calculated the standard deviation of the 55 vulnerability/risk indices in each grid cell to get the certainty map. These two maps show together the most plausible approximation of vulnerability/risk in each grid cell and the certainty related to the approximation. We visualized maps using quintiles, which divide grid cells into five categories having equal number of cells (Wiréhn et al. 2015). Hence, quintile visualization shows patterns of relative vulnerability or risk, which is often more important than absolute showing absolute values (Nelson et al. 2015). When constructing the composite consensus-certainty map, we visualized consensus map quintiles with different hue options (i.e., color) and certainty map quintiles with saturation (i.e., brightness of the color). According to the Delphi, old age, health, and childhood were the most significant factors when it comes to individual vulnerability to heat waves in Helsinki (Table 2). In particular, those of advanced age were considered to be vulnerable to disruptions in critical services, water, and electricity, also due to lower physical health and reduced mobility. Migration and gender were not considered to be as significant as the other determinants. However, in the interviews, the issue of language barriers was raised several times, due to many critical public warnings and announcements being provided in Finnish and Swedish only. Furthermore, some interviewees discussed how vulnerability of women is increased by their lower car ownership and resulting heavier reliance on public transportation services. The interviewees raised also more detailed sector-specific concerns. For example, public transportation experts raised concerns regarding the increased heat stress passengers are exposed to in older, non-air-conditioned transport vehicles during heat waves, and the possibility of thermal expansion of railways hindering the use of rail transport. In turn, experts of electricity distribution and water works noted how disruptions in their services during a heat wave might significantly increase the vulnerability of individuals particularly prone to dehydration and heat stress, such as the elderly. There were large differences in the vulnerability maps caused by different zonings (Table 3; Fig.1a, b). The maps using municipal boundaries had low correlations with the maps using smaller administrative units, but the differences between the three smallest administrative units (small, medium, postal) were relatively small (Table 3). Large administrative units had higher correlations with smaller administrative units than with municipalities, but overall, their correlations with other maps were relatively low. The differences caused by changing administrative boundaries were notably smaller in risk maps (Table 3; Fig. 1c, d) than in vulnerability maps. There was relatively little difference between weighted and unweighted vulnerability or risk maps when similar zoning was used (Fig. 1e, f). The consensus vulnerability and risk maps (Figs. 2a and 3a) had generally high correlations with maps using a single index only (Table 3). Nevertheless, in the vulnerability maps, the dissimilarities were high between municipal maps and consensus vulnerability maps (r 0.15–0.37, Fig. S2). The certainty maps (Figs. 2b and 3b), drawn with the help of standard deviations, were similar for vulnerability and risk. When the certainties were combined with average risk or vulnerability scores, final maps showing the potential risk/vulnerability and its certainty could be constructed (Figs. 2c and 3c). Interestingly, some areas, such as Helsinki City Centre (shown in the bottom centre of the maps) had both low vulnerability and high risk, but at the same time, low certainty. We analyzed how the vulnerability and risk maps differ when different zoning and weighting options are used. We found that zoning has a large effect especially on the vulnerability maps but its effect on risk maps is smaller. Weighting had a smaller effect on the final maps. We also constructed consensus and certainty maps to visualize the certainty of vulnerability and risk maps and found that these maps showed their potential, for instance, in highlighting areas, which may have both high risk/vulnerability and high certainty for risk/vulnerability. According to our results, weighting caused small differences in the final maps, which is in contrast with the results obtained by Wiréhn et al. (2015) and Reckien (2018). In our analysis, the range of weights was 1–8, which has an effect on the results. Giving heavier weight to most relevant indicators could have altered the picture. For instance, in the work by Reckien (2018), weights ranged between 1 and 21. There are also other weighting options than multiplying indicator values. For instance, Wiréhn et al. (2015) combined three different weighting options based on principal components analysis with three different summarization techniques. Overall, it is perhaps more important to show and discuss how the weighting alters final maps than trying to find out the best method for weighting. In the puzzle of setting weights, different visualization tools used in wider stakeholder processes (Bohman et al. 2015; Carter et al. 2016; Rød et al. 2015; Wirehn et al. 2017) may also help, especially if one considers that vulnerability mapping is a learning process, rather than considering the final maps as the most important product. It is also possible to include processes of validation and negotiation into the stakeholder process when weighting indicators (Carter et al. 2016; Rød et al. 2015). We found that when different zoning options are used, the spatial pattern of vulnerability may differ dramatically, which is in line with previous studies (Rothlisberger et al. 2017; Salmivaara et al. 2015). Especially in the vulnerability maps, the spatial pattern drawn with municipal boundaries was too coarse, as there was considerable intra-municipal variation. Additionally, vulnerability maps using municipal boundaries, or the large zoning option, were also quite different from the maps using smaller units. 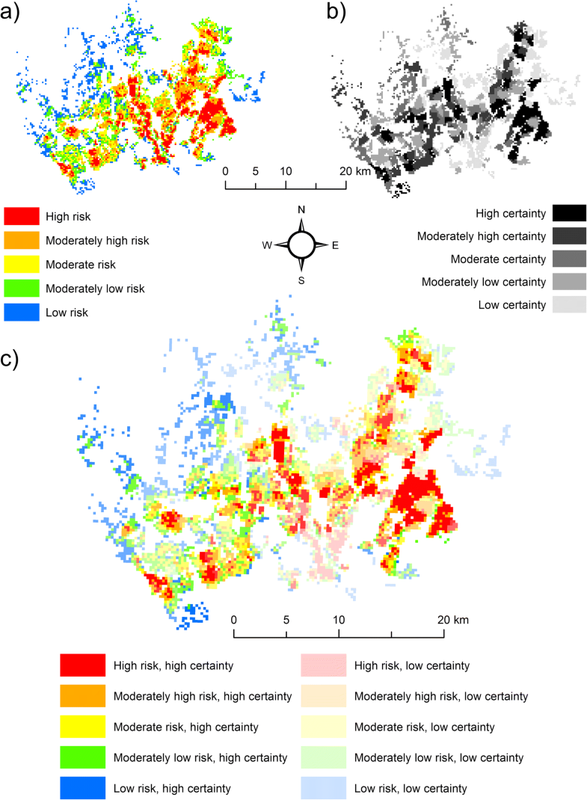 This questions the usefulness of vulnerability and risk maps that use municipalities or even larger areal units as the basic unit, which have been used quite widely in index-based studies (e.g., Carter et al. 2016; Rød et al. 2015). It has been argued that spatial units should be preferably very small as there is fine-scale variation in the spatial patterns of risk components (Nelson et al. 2015). In our smallest zoning option, the average size of one zone is 2.6 km2 and the average population nearly 4000. In earlier studies in Helsinki metropolitan area, it has been found that there is a clear trend in social segregation when evaluated using 250 m grid, but this trend is not visible when analyzed using smallest statistical zones (Kortteinen and Vaattovaara 2015). We could not use the grid data in our research due to its high cost, but it can be questioned whether the spatial pattern in vulnerability would differ, if grid data instead of statistical zone data would be used. On the other hand, in our analysis, the correlations between vulnerability maps with three smallest zoning options were small. This could suggest that already the medium zoning option indicates relevant spatial patterns in vulnerability. Furthermore, even the inclusion of the grid data would not have changed the conclusion that the chosen zoning option affects final map. Risk maps had smaller differences between each other than the vulnerability maps, probably because hazard and exposure were similar in each risk map. In other words, as equal weights were given to vulnerability, risk, and hazard, two thirds of the weight were given to similar maps in each risk map. However, some of the high (or low)-risk areas had low certainty. Therefore, the consensus and certainty maps allowed for the visualization of relative certainty, which can be more important than absolute values or certainty. For mapping risk, we downscaled the vulnerability maps with the help of hazard and exposure maps. This technique helped in detailing spatial patterns in temperature and population, but did not downscale the social structure of vulnerability. If the social structure within a statistical zone is relatively uniform, population-based downscaling highlights the areas, which have highest population density and high vulnerability. However, if the social structure is not uniform, the method highlights only the areas which have high population density. It has been discussed earlier that areas with high population density might have high risk (Cutter et al. 2003; Reckien 2018). Hence, it could be argued that high spatial resolution hazard and exposure maps could be combined with vulnerability maps having any reasonable spatial resolution. Alternatively, vulnerability maps could show the amount of vulnerable population. In this case, choices in map production such as weighting, indicator selection and data normalization affect the final maps less than when vulnerability maps show the proportion of vulnerable population (Reckien 2018). In addition to population data, there are other data options in downscaling vulnerability, such as cadastral data (Nelson et al. 2015). Our approach complements previous approaches dealing with modifiable areal unit problem (MAUP). The main asset of our methods is the fact that consensus and certainty maps fuzzify the vulnerability and risk maps and help in pointing out the differences between maps. Our approach is also in some ways beneficial to earlier methods, which have analyzed and mitigated MAUP. For instance, the Getis-Ord spatial autocorrelation statistics can be used in identifying hotspots (Ho et al. 2015; Rothlisberger et al. 2017). In Getis-Ord, a single map should be used as a starting point. This restricts the use of the method in analyzing uncertainties and differences between different mapping options. Therefore, Getis-Ord can be thought to be a merely an advanced visualization technique in finding spatial trends. Another question is that whether spatial autocorrelation, which is analyzed in the Getis-Ord, is a relevant phenomenon for climate risk and vulnerability. On the one hand, Getis-Ord can reveal spatial clusters in which vulnerability or risk is high on a larger area. On the other hand, it may underestimate risk on risky areas with small spatial extent located within areas with low risk. The problems with Getis-Ord are also evident in the geon approach in which optimal vulnerability units are formed by aggregating spatial data into homogenous regions based on grid cell-specific indicator values (Kienberger et al. 2009; Lang et al. 2014). Also, in the geons, a single final map is presented, which should then be the optimal map for vulnerability or risk. The main asset in geons is that administrative or statistical boundaries that are often arbitrary when looking at risk and vulnerability are replaced with more meaningful boundaries, which ideally should reflect the spatial pattern in risk and vulnerability. However, both Getis-Ord and geon approach would benefit from analysis of uncertainties in the input data including how different choices in index-production such as weighting affect the maps. Given the increasing need to use maps in adaptation planning, it is clear from our analysis that there is a need to address the uncertainties related to the data used, as well as the method. We show how weighting and especially zoning can have a large effect on vulnerability and risk maps. In addition, there are also other options in map production such as indicator selection, data normalization, and visualization which have effects on the final maps, and sensitivity analyses assess the uncertainties evident in every map-making process. We argue that there is a need to move from crisp vulnerability maps to maps that also show the uncertainties in the maps. Instead of showing just one value for risk/vulnerability in each location, several possible vulnerability/risk values and uncertainties related to the values should be shown. We show how simple techniques using maps of consensus and certainty help in this. The maps of certainty could help policy-makers and other stakeholders in understanding the probability of vulnerability and could thus help to facilitate more critical use of maps. Furthermore, they would increase the credibility and trustworthiness of the maps. Therefore, we urge that focus in vulnerability and risk mapping should be in map-making process instead of final maps showing “certain” vulnerability and risk hot spots. One final map can be misleading or even erroneous, and a bunch of possible maps show the nature of vulnerability and risk more realistically. On the other hand, stakeholders often prefer simple and single maps (de Groot-Reichwein et al. 2018; Reckien 2018), and thus there should also be methodological development to visualize maps so that uncertainties can be showed understandably to various stakeholders. Finally, sensitivity analyses are of utmost importance when mapping future climate risks, because there is deep uncertainty in future spatial patterns of different risk components, especially vulnerability (Jurgilevich et al. 2017).